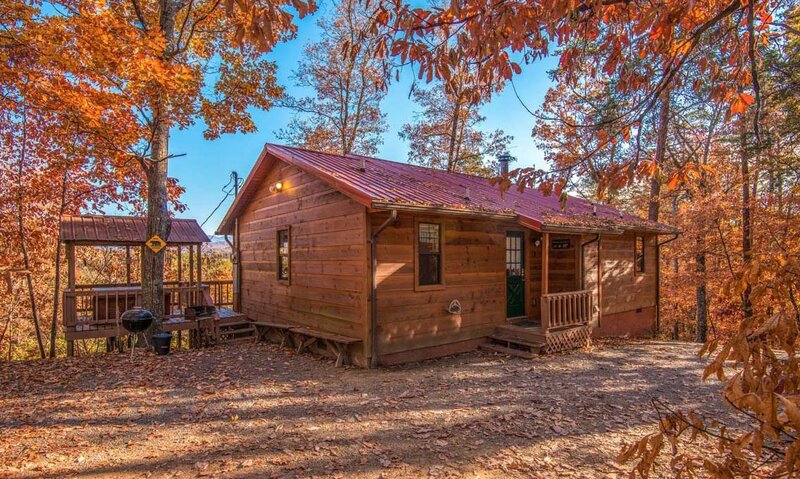 Tucked away in the tranquil trees lies the cabin of Serenity — a place of calm, comfort, and peace in the Great Smoky Mountains. 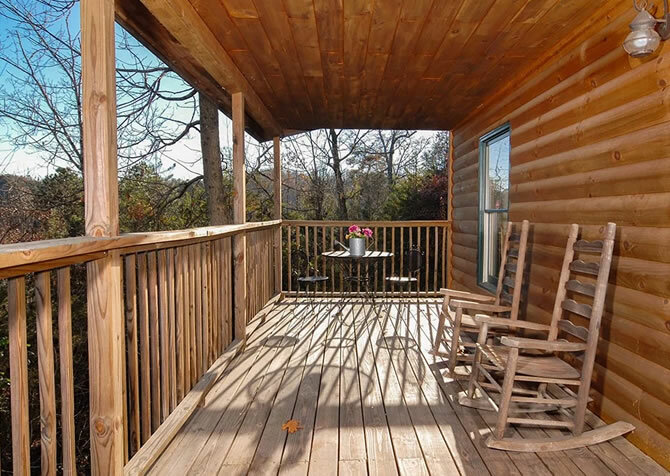 About 2 miles from all the activities and attractions of Pigeon Forge, this 2-bedroom, 2-bathroom home lets you experience nature without being too far from the city. With 2 master suites, a private picnic area, and an outdoor hot tub, this pet-friendly cabin sleeps 6, making a great place for a family vacation or a getaway with friends. 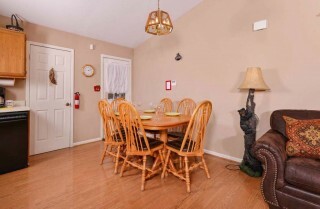 It’s also outfitted with extras to make your stay easier, including a Keurig coffeemaker and Google Chromecast for streaming your favorite shows or games! In town, less than a mile away, you can spend all day exploring. Dollywood, alpine coasters, and dozens of unique shops are just down the road. 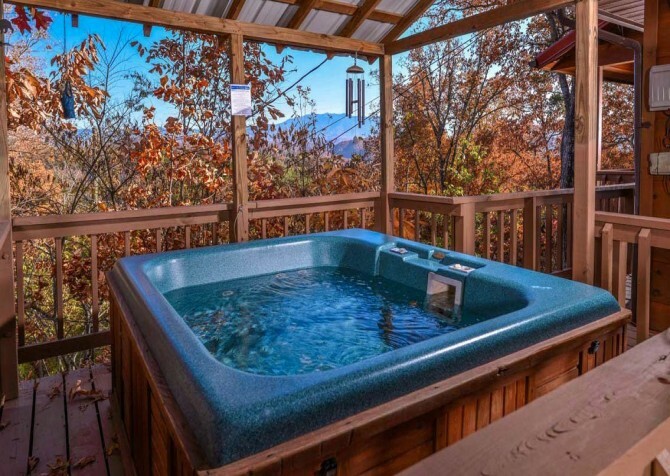 At The Island, spend the day trying to break out at The Escape Game, riding the Great Smoky Mountain Wheel, testing your bravery on the ropes course, shopping at boutiques, eating at celebrity-owned restaurants, and more! 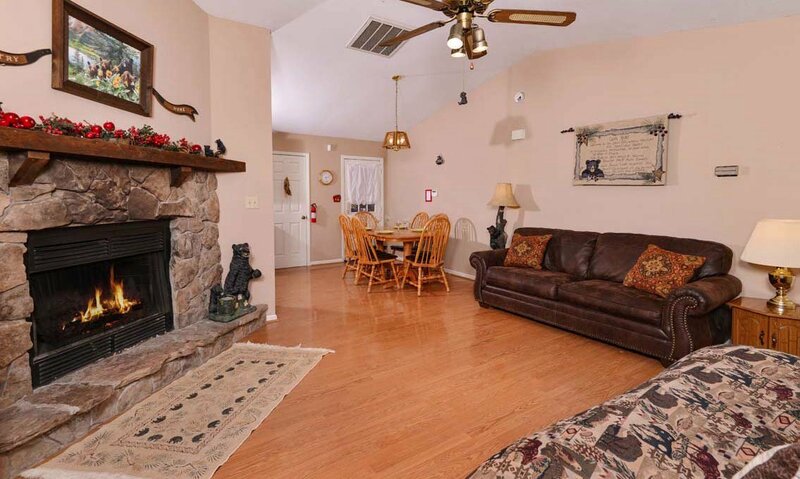 Step into the bear-themed living room just off the dining area — there’s even a cute little black bear who will help you adjust the ceiling fan! With a wall-mounted flatscreen TV, DVD player, and Google Chromecast for streaming, binge-watching your favorite series won’t be a problem. Just plop down on the plump couch for a comfortable viewing spot. If TV shows aren’t your style, maybe video games are, so a classic Xbox system (with timeless games) has been provided for your convenience — the kids will definitely appreciate this. In addition to 2 rustic antler lamps, there is also a novelty floor lamp with — wait for it — bears climbing a tree (how cute!). However cool the floor lamp may be, nothing beats a warm, cozy fire from a wood-burning fireplace. 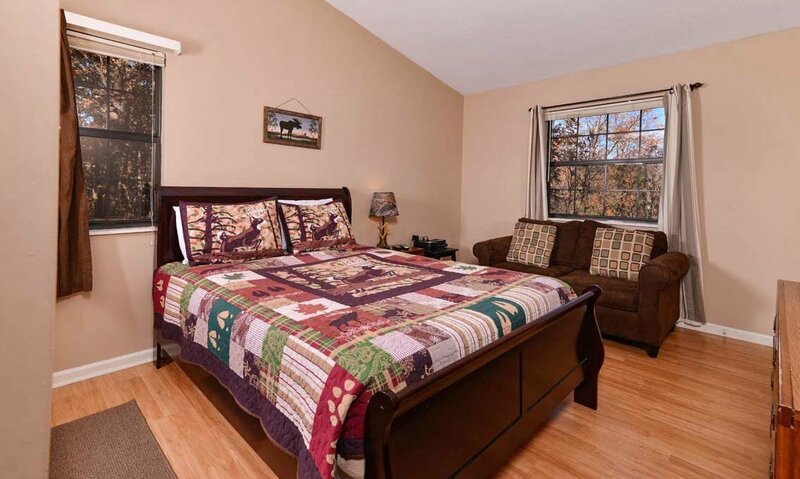 Like the cabin rules state on the living room tapestry (with a bear of course), “Take time to Rest, Relax, & Renew” in this chill space, and maybe take a peek at the enchanting mountain view from the window. 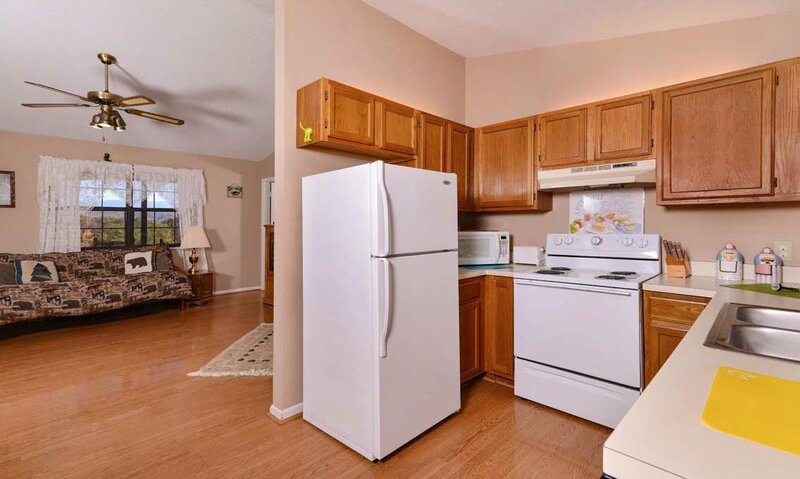 As you step into the cabin, you’ll find the kitchen to your immediate right, which makes it more than easy to unload the groceries for the family barbecue later. 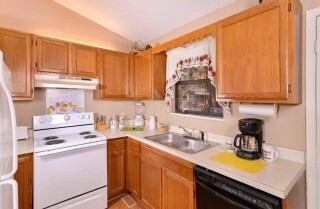 Fully equipped with a double sink, dishes, silverware, mugs, pots and pans, and more (including a wine opener — yes! 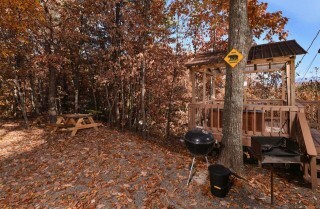 ), this cooking space is just what you need to create, serve, and eat scrumptious in-cabin meals. 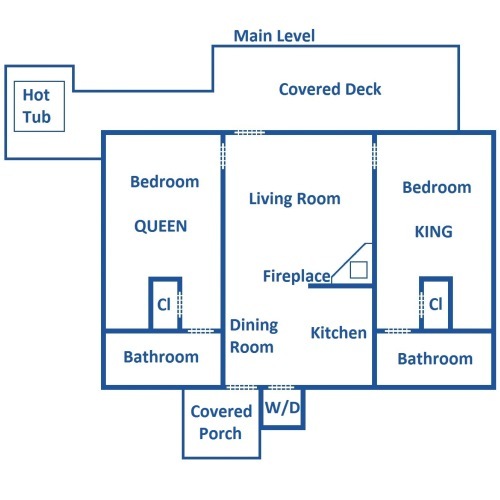 Plus, it comes with all the appliances you’ll need: a refrigerator, a stove, a microwave, a Keurig coffeemaker, a toaster, a blender, a can opener, and the most helpful tool: a dishwasher. Bake some blueberry muffins to go with your coffee in the morning, and if you’re feeling a bit “Master Chef,” try out the apple pie recipe on the backsplash! Near the kitchen is the dining area with a wooden table and 6 matching chairs, complete with cushions for that extra bit of comfort and an overhead chandelier. Fuel up for your day of Pigeon Forge adventures, have the kids set the table while you dish up some homemade chili, or forego the formalities and set out a pepperoni pizza for everyone to grab a slice freely. When dinner is done, clear the table for game night — a rousing round of cards is always a pleasant treat! Two master suites await you in this cabin, so fighting over the best bedroom won’t be a problem here. In fact, each bedroom has a mounted flatscreen TV, a dresser with a mirror, new bedding, an en suite bath (with double sinks), a closet supporting a full-length mirror, 2 windows, an end table with a lamp, and a jetted tub! 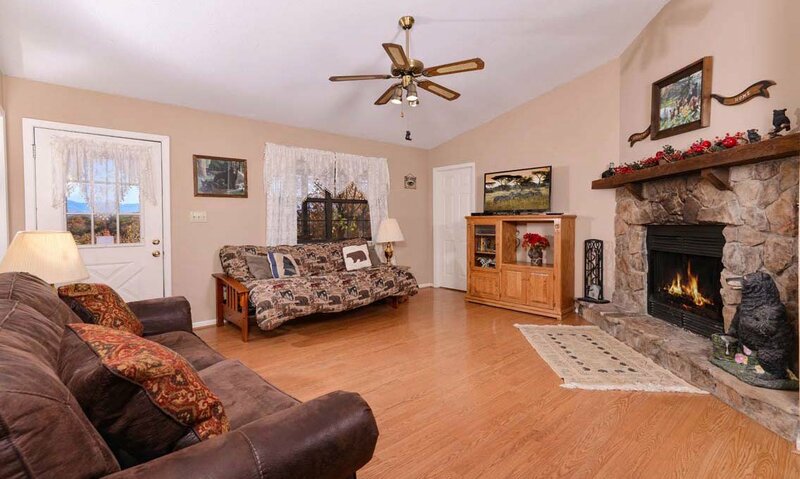 To the right of the living room is the first master, which features a king-size bed and a new recliner. To the left of the living room is the second master, which features a queen-size bed and a loveseat. Take an evening bubble bath, invite everyone onto the bed for a movie night, and sleep ‘til noon — it’s your vacation, after all. Schedules don’t matter; relaxation does (read the tapestry). 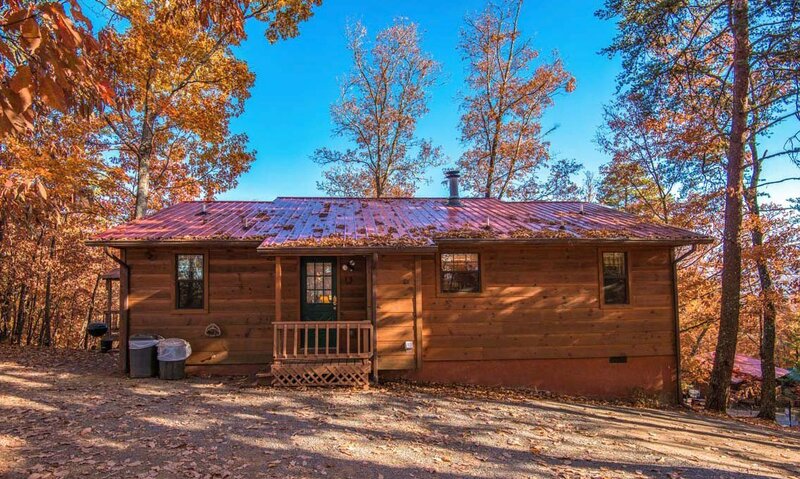 As you pull up to this ready-and-waiting red-roofed cabin, you’ll notice that the paved driveway is slightly steep and ends with parking for 2. 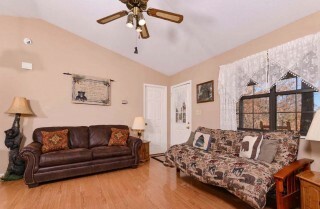 Only a few steps up to the covered front porch, unloading the car will be a breeze. To the left of the cabin and under the trees for shade is a private picnic area with a charcoal grill and — of course — a picnic table. If you don’t feel like watching beef patties cook or kabobs grill, take a load off on one of the 2 benches near the house. 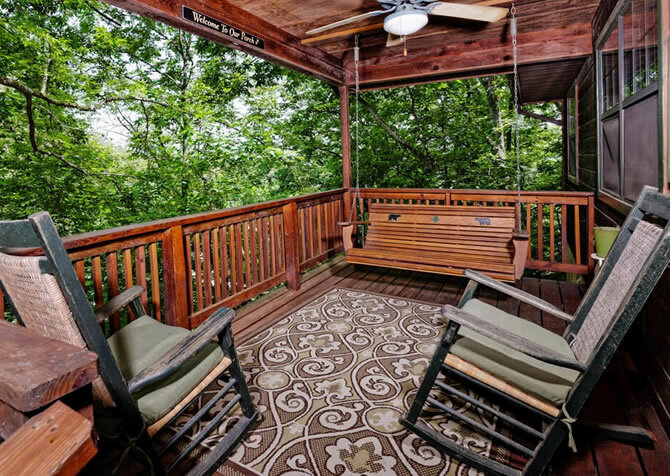 Better yet, with direct access to the back deck, you can unwind on one of the 4 rocking chairs while someone else makes dinner. After your food settles, take a soak in the covered outdoor hot tub and let the soothing sound of the wind chimes’ song lull away your cares. Would you like to bring your little pup to the mountains with you? 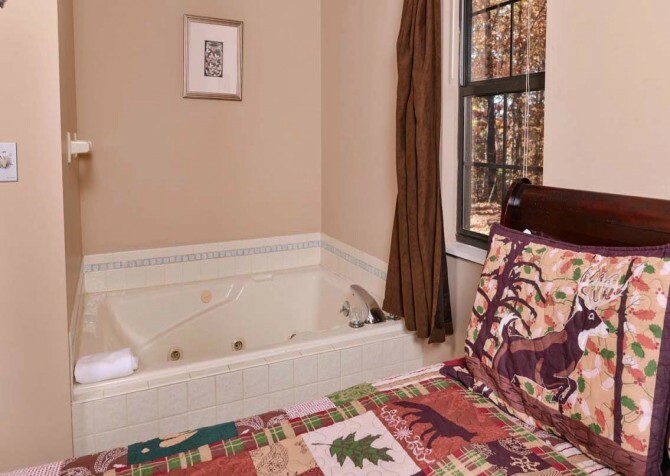 Well, that won’t be a problem at this pet-friendly cabin. Your fur baby can happily cozy up for movie night, too! 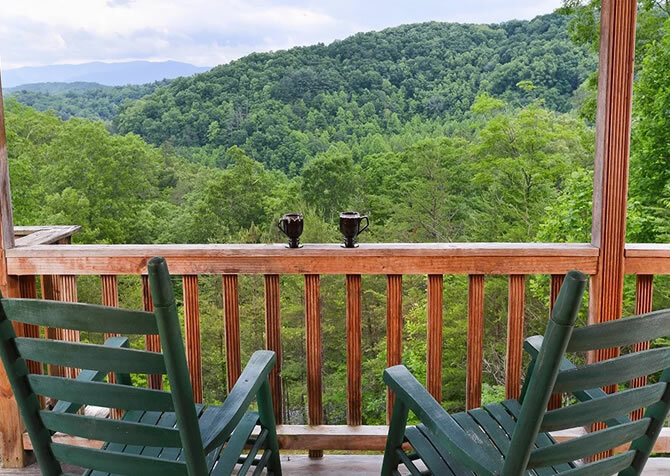 High-speed Wi-Fi is also provided, making it easy to share all your Smoky Mountain experiences with your Facebook friends, Twitter followers, and YouTube subscribers. Should you feel the need to get some laundry done, a washer and dryer are available in your cabin right off the kitchen. If an old-school dance party is what you seek, the cabin’s CD player is just the thing you’ll need. 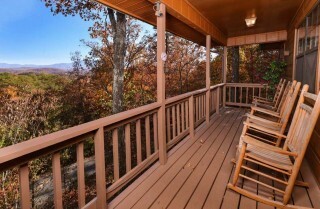 Bring your pop, rock, and country CDs, and get your jam on in the Smokies! With so many local activities and attractions in Pigeon Forge, deciding what to do can be difficult. Feel free to look over the recommendations below and let your vacation grow from there! 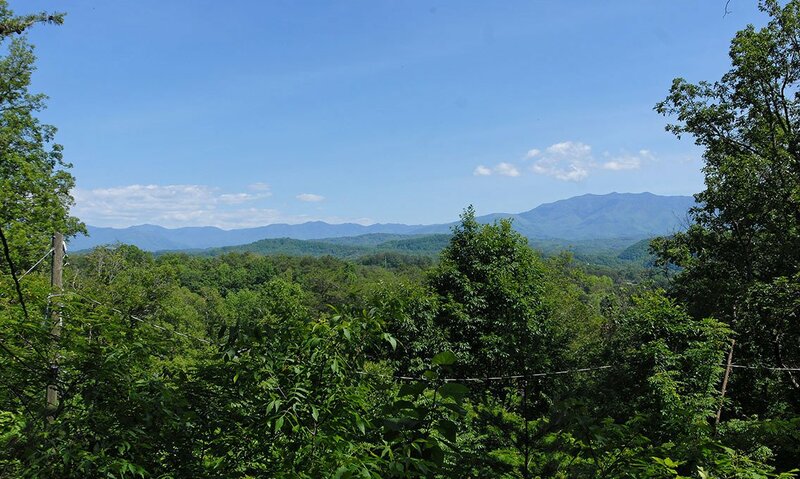 Don’t let the name fool you; this breathtaking golf course is located off Dollywood Lane in Pigeon Forge. They even have discounts for seniors and active military, so grab your family and hit the green! Only a few miles down the road, Dollywood is a happening amusement park with something for everyone to enjoy. Watch skilled artisans mold their creations right before your eyes, eat tasty treats all around the park, dare your best friend to ride the tallest rollercoaster, see our country’s national symbol — the bald eagle — in person, and more! A great place to take the kids, MagiQuest is a magical world where you use a wand — like Harry Potter! — to solve various mysteries on your role-playing quest. Finding it is easy; just look for a big castle on the Parkway! 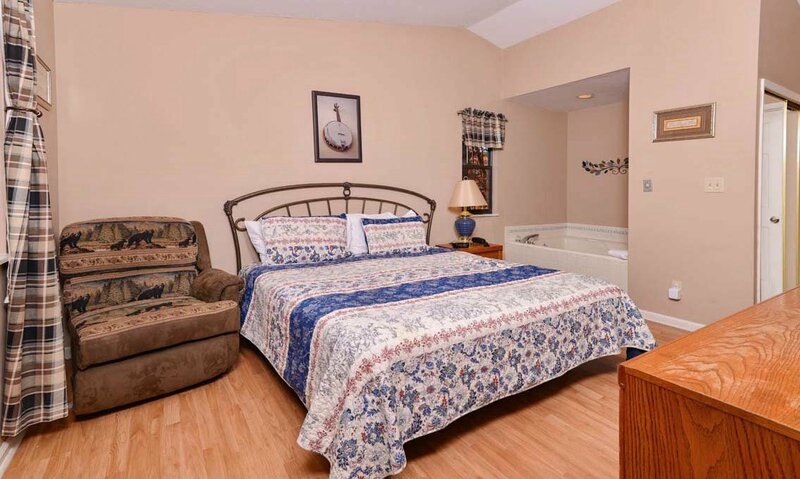 If you’d like more information about Serenity, give us a call at 1-800-684-7865! "I was very happy with our stay. The cabin could not have been any cleaner, which I was sooo happy about! I will definitely book through you guys again!" It means so much that you took time to submit a great review, and we are even more thrilled you enjoyed your stay at Serenity. We look forward to serving YOU in the future! "Everything was clean and ready to use. I have used this cabin before and plan on using it the next chance I get to go to the Smokies. 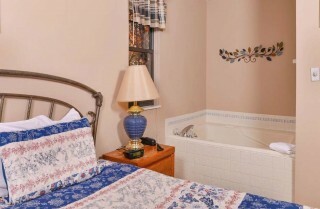 It's better than a hotel because of the peaceful location and the value was better. We enjoyed being able to cook some of our meals and sit back and relax. The turn up the driveway and the turn around at the top were tight but that's the mountains." 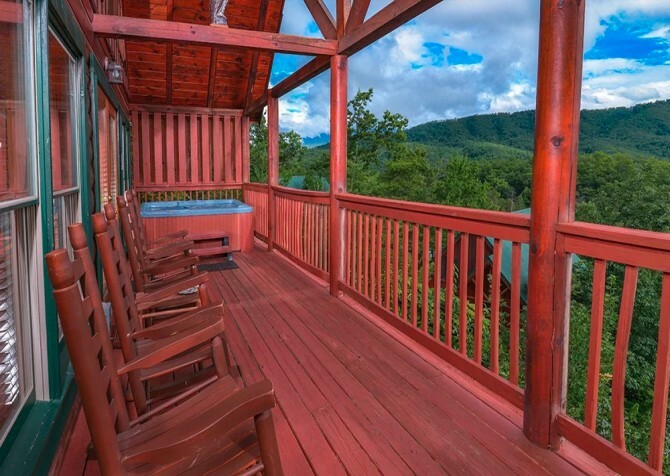 "A beautifully unobstructed view of the Smoky Mountains from the deck and hot tub. Heavily wooded area out the front door. Adequate parking for 3 cars. 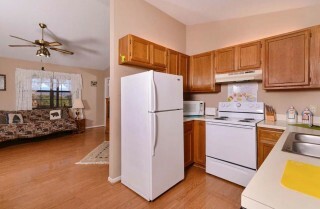 Very clean and well maintained with plenty of room. We had 3 adults, 2 ten year old grandchildren and a golden retriever. Instruction sheet on counter answers most questions. If any questions, call the number. The lady I talked to was wonderful. 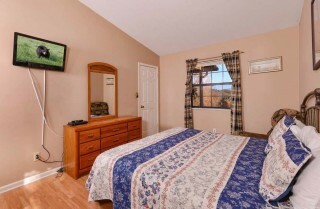 TVs in each bedroom plus the family room, good WI-FI connection. It's a steep hill to the cabin and could be tricky with stick shift but definitely very doable. Restaurants in Pigeon Falls can be pricey with long wait times. The Titanic is a great museum if you are interested in such things, allow 2 hours. The water light show in the evening in Pigeon Fall is worth seeing. It’s free! Gatlinburg is a half hour away if you want more touristy things. "Best Italian" Cafe has good food, great Bloody Marys, friendly and reasonable prices for the area. If you’re going beyond Gatlinburg, be sure to use the bypass. I was with my daughter and my 2 grandsons and had a wonderful time. Other fun things we did: horseback riding at Smoky Mountain Riding Stable, great for non-riders; Indoor Laser Golf, for a rainy day, Lumberjack Feud Dinner Show." 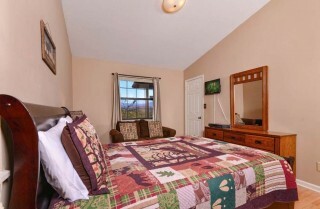 Stay in Pigeon Forge Year Round! Play All Day at The Track!